There are so many things that to teach a new puppy that it can be a little overwhelming to think about it all at once. Where to even start? One thing to keep in mind is that what your dog learns first, he learns best. 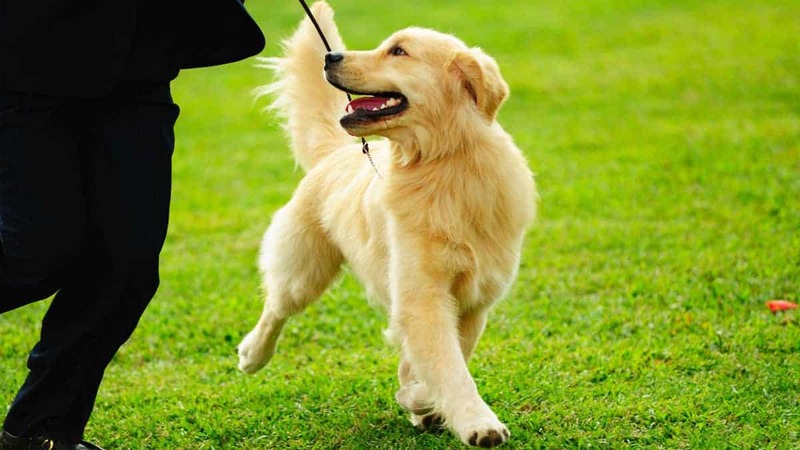 Those first behaviours are going to have the longest and strongest reinforcement history in your dog’s mind, and will probably be the first behaviours that he offers to get your attention. It’s really cute when puppies wave their front paws in the air or bark for the first time in an attempt to get your attention. It’s not as cute when an adult dog is demanding your attention by barking in your face or greeting guests by swatting them with his paws. An easy way to avoid those less than desirable habits is to start your puppy’s training by concentrating calm, focused behaviours like the ones listed here. Training your puppy to pay attention to you is one of the most important things that you could ever teach him. Attention is the foundation behaviour for EVERYTHING else that your dog will ever learn – if he’s not paying attention to you, he’s not going to be able to respond to any other cue that you give. Start by reinforcing eye contact. With really young puppies, set a kitchen timer for 1-2 minutes and click and treat them whenever they make eye contact with you. The sessions should be short and lots of fun! When your puppy is really good at offering eye contact, you can start adding his name into the equation. Say his name one time, wait for him to make eye contact with you, and then click and treat when he does! Practice this with your puppies every day and in different environments, it is important that they learn how to pay attention to you, regardless of where you are or what’s happening around you. You can avoid a myriad of bad habits from the start by teaching your puppy to sit when he wants something. For example, you can teach your puppy to sit when he wants attention or something that you’re holding in your hand. Jumping up for attention or to try and steal whatever you’re holding doesn’t work – it makes humans ignore you or walk away. Sitting, however, makes humans fawn all over you and makes them MUCH more likely to give you the piece of food or toy that they are holding. Sitting is so much fun! To start working on this, sit or stand in front of your puppy and just wait until he happens to sit. As soon as he does, click and drop a few pieces of food on the ground. This is a really fun game and pretty soon your puppy will be sitting in front of you right away. Once he understands that part of the game, you can start practicing sit for the food bowl at meal times, sit for the leash before walks, or sit for the ball before starting a game of fetch. A hand touch is a really simple behaviour in which your puppy is going to target his nose to your palm. That may seem like a really silly thing to teach your dog, but this cue will come in handy in quite a few different scenarios. You can use the Hand Touch as part of your recall training to make sure that your puppy comes all the way to you and stops. You can use Touch to encourage your puppy to greet new people calmly and without jumping. Touch can be used to teach mouthy puppies to be gentler around human hands and fingers. 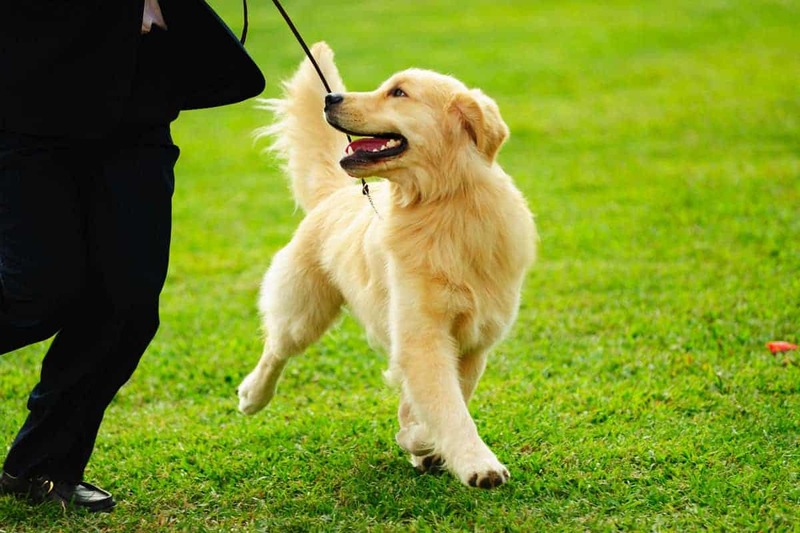 Finally, touch can serve as part of your foundation training for more difficult skills moving into heel position, walking nicely on leash, and a variety of tricks. To start teaching your dog this game, hold your hand down in front of your dog’s nose with your palm facing him. Most dogs will lean forward to check it out. As soon as he touches his nose to your hand, click and give him a treat! Puppies explore the world by putting everything into their mouth. We do our best to puppy-proof our living spaces, but there is always a possibility that he will find something that we don’t want him to have. If you are constantly following your dog around and pulling things out of his mouth, there’s a good chance that he will start to run from you when he sees you approaching while he has something in his mouth because you always take his treasure away from him – that’s not fun! Instead try trading him for a different toy or a piece of food. Hold out your toy or bit of food so that it’s right in front of his face while he is playing with the object that you want. As soon as you see him start to let go of what he has, say “drop” and then give him your toy. As he is taking the toy or food that you’re offering him, use your other hand to pick up his original item. Both of you win in this scenario! This is a great game that will encourage your puppy to pay attention to your movements and follow you when you are walking. Playing this game is a great way to set the stage for walking on a loose leash as well as teaching your dog to stay close in areas where he can be off leash. Start working on this game in a quiet room of the house. Have a clicker ready and some of your puppy’s food in your pocket. Start walking in slow circles around the room and wait for your puppy to appear at your side. As soon as he does, click and treat. Continue to click and treat for each step he takes while at your side. If he chooses to leave, all clicks, treats, and attention from you stops right away. When he comes back, start the game again! When your puppy is really good at this game, you can make it harder for him by increasing the number of steps he has to take with you in order to earn a click and treat, you can move faster, add turns, and take the game to different rooms throughout the house or into the backyard. After a few weeks of practice, take this game to the park and continue practicing with more difficult distractions. It is much easier to develop good habits from the beginning than it is to change bad habits later on. By reinforcing calm, focused behaviours you are setting your puppy up for a lifetime of good manners and polite behaviour!